We’re always looking for people with a passion for healthcare to work in our stores. 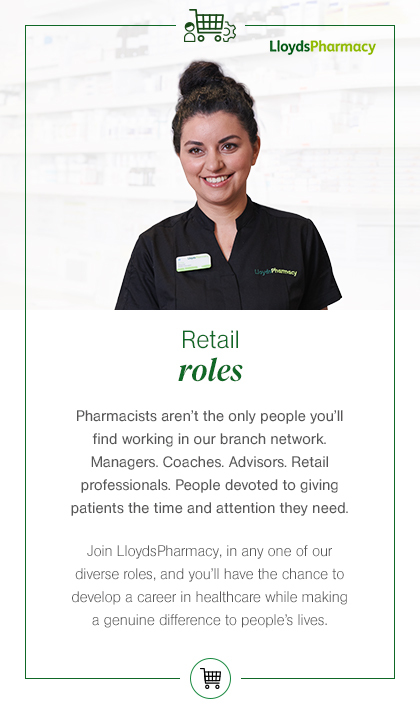 Whether you join us as a trainee healthcare partner or on the retail management side, you’ll play a crucial role in helping to run your pharmacy and will be one of the trusted faces of LloydsPharmacy. Level 3 Technician qualification or develop into a supervisory role. If you join us as a Retail Manager and haven’t worked in pharmacy before, we’ll support you through your trainee healthcare partner qualification too, enabling you to manage your store effectively and provide patients with great healthcare advice. be. Typical roles include Cluster Manager, Area Manager and Area Coach. We make sure everyone at LloydsPharmacy has opportunities to learn, grow and develop, whatever role they are working in. From the moment you join us, you’ll be supported with development specific to your job, whether that means studying towards a professional qualification or building skills that help you master your role. You’ll also be able to access our comprehensive learning platform, mylearn plus, which provides lots of opportunities for you to develop your clinical skills.